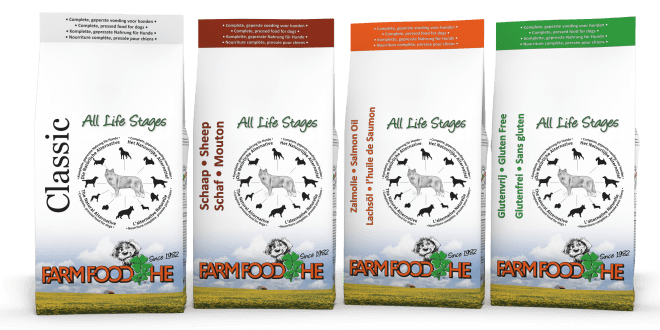 Farm Food HE is a premium High Energy pressed food suitable for every dog, regardless of age, activity or breed. We call this the All Life Stages concept and is based on the fact that digestion in dogs is still the same as that of their ancestor, the wolf. In nature, wolves and other canines eat the same prey, irrespective of their age; young and pregnant animals eat more and older animals eat less. All this contributes to puppies growing very evenly without annoying growing pains. The low production temperature during pressing ensures that the dog’s metabolism is burdened as little as possible. This promotes excellent health, which is reflected in the quality of skin, coat and faeces. Older dogs experience a second childhood and often become more lively. Farm Food HE stands out due to its transparent composition, pure ingredients, high biological value of the proteins and very high digestibility (84-87%). All animal ingredients in Farm Food HE are derived from animals from the E. U. approved for human consumption. 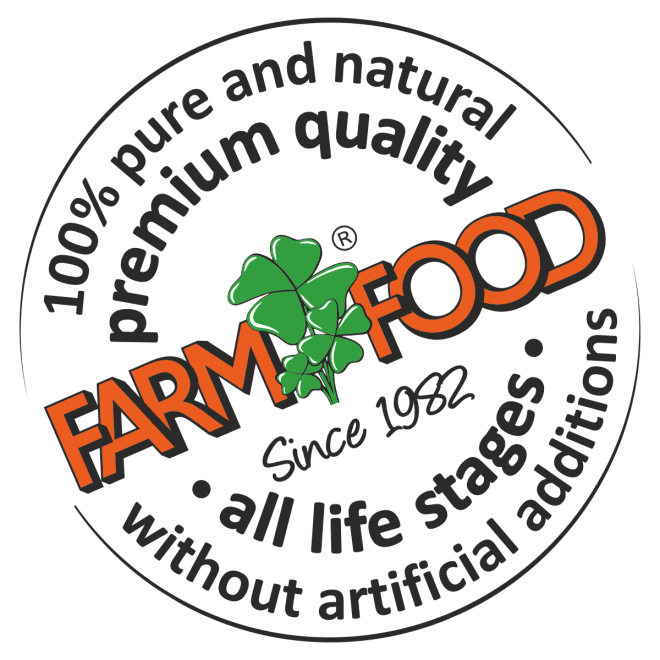 Farm Food HE is made from meat meal (beef or mutton) and haemoglobin powder, supplemented with minerals, vitamins, trace elements and Scottish salmon oil or the “ancient grain” Sorghum. Before Farm Food HE is pressed, the cereals are activated (pre-digested). This makes them highly digestible (97% or higher) and provides important nutrients and energy in the form of carbohydrates. … there is a big difference between crunchy/extruded dry food and Farm Food HE? For extruded food, the production temperature is higher than 120°C. Cold-pressed Farm Food HE has a production temperature of below 75°C, as a result of which vitamins, fats and all other important nutrients are much better preserved. … the combination of fresh meat and extruded food may cause nausea or vomiting? Because cold-pressed Farm Food HE and fresh meat produce a similar effect in the stomach, they can be mixed. … legumes and potatoes contain substances that may damage your dog’s health? That is why we do not use these ingredients in the preparation of Farm Food HE and our other products. … approximately 75% of the protein in Farm Food HE comes from animal products? The ingredients we use are haemoglobin powder and beef or mutton meal, which have a very high protein content. To obtain the right amount of protein in Farm Food HE, only a small quantity is required. This explains why these ingredients are not listed as the main ingredients. … Farm Food HE is available in two sizes? Standard 8 mm and mini 6 mm. … meat from young animals such as chicken and other poultry, which is often used in dog food, still contains a lot of natural growth hormones? Growth hormones can adversely affect dogs’ hormone management. For this reason, we do not use chicken or other poultry in our Farm Food products. Complete, cold-pressed food for dogs.